The Muppets are back. Again. It only took one motion picture after their triumphant return to the big screen, but the bloom is definitely off the rose when it comes to what makes the Muppets special. Muppets Most Wanted brings back much of the same creative team behind 2011's The Muppets, but something is missing. The wide variety of jokes are in there, everything from pratfalls to the best "Wocka Wocka" punchlines Fozzie Bear can muster, and the slew of cameo appearances is still on full force. And yet Muppets Most Wanted ultimately comes off as a cash-grab slapped together to keep this Muppet train a-rollin. At least they don't start this one with a song all about the greatness of sequels. Oh, wait. They do. That song about sequels hits right at the start, so immediately after the 2011 film ends that "The End" still shines amidst fireworks in the sky. But, since everything in the Muppet's world is about showbiz, all those dancers, die-hard fans, and even Jason Segel and Amy Adams - paid actors as we discover - have gone home, and Kermit the Frog and the gang are left to wonder what's next for them. Cue the sequel song. Also cue Ricky Gervais as the appropriately named Dominic Badguy. Posing as a talent agent, Badguy convinces the gang to take their show on the road, a European tour that will hit all the major cities of the old world. In actuality, Badguy is working for Constantine, the world's number one criminal and most dangerous frog. As chance would have it, Constantine looks exactly like Kermit, and a quick switch puts the criminal mastermind in charge of the variety show while our favorite frog gets sent to a Siberian GULAG. It's not that intense, though. No place can be that dangerous with Tina Fey as a guard and Jemaine Clement, Ray Liotta, and Danny Trejo as song-and-dance-happy inmates. Those names make up just a small batch of the cameos on display in Muppets Most Wanted. Christoph Waltz, Tom Hiddleston, and Salma Hayek are a few more in the international flavor the film is going for. But cameos in a Muppet movie are as much a staple as the Muppets themselves. It's not as if this element to the Muppet franchise has ever been the most creatively handled, and seeing James McAvoy pop up for two seconds as a UPS deliveryman is just awkward. A few, though, are both creative and funny, chief among them being Josh Groban, also as a GULAG inmate, locked in a box for much of the film. Like the cameos in these films, the jokes have always been about law of averages. Throw as much at the audience as you can, and some of what hits them might stick. 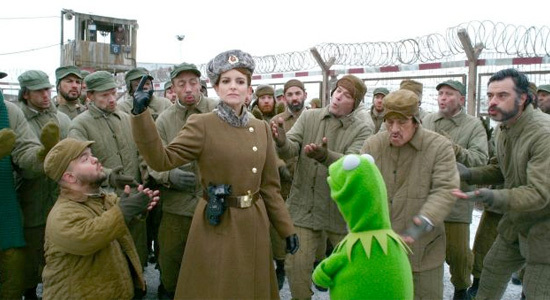 Muppets Most Wanted is, for the most part, harmless fun. But unlike 2011's The Muppets, which strove both for winning over a younger audience while also feeding the nostalgia of age-old Muppets fans, this film is strictly targeted at that younger audience. Little moments of creativity seep in here and there. See the Swedish Chef parodying Bergman's The Seventh Seal for an example of that, but the majority of laughs here aim for the broadest target possible. A key element that completely works involves Ty Burrell taking on a French accent as an Interpol agent hot on Constantine's heels. 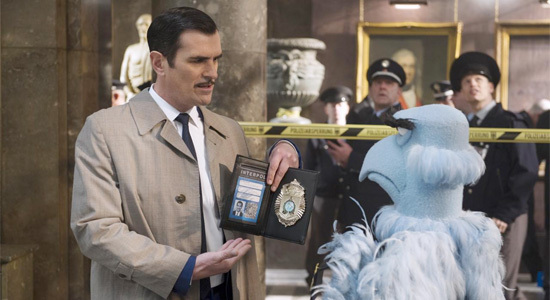 Burrell's agent teams up with Sam the Eagle, here an agent for the CIA, and the buddy-cop potential of this pairing makes it the best choice Muppets Most Wanted makes. Unfortunately, like much of the rest of the film, it never quite lives up to that potential. Somewhere in that bloated, 110-minute runtime they could have developed that subplot more than Burrell's character taking way too much downtime. Still, no matter how annoyingly kid-friendly his accent is, Burrell is always a plus. When all is said and done, that's the column where Muppets Most Wanted cruises by. The jokes have always been a little cheesy with the Muppets, but that was forgiven due to the genuine heart they always brought. Even Muppets from Space made you feel a little something for Gonzo. This movie aims for nothing but the funny bone, and, to its credit, a jab or two get through. That and the cameos - always a fun time in Muppet movies - are more than enough to make it worthwhile for the typical kids' movie that it is. You can't help but wonder, though, where that magic and uniqueness went. They probably went home with Jason Segel. Well to be fair that pretty much sums up most movies!